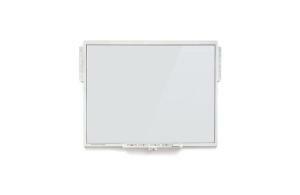 Triumph Board Multi Touch is true multi-touch, with no separate multiuser mode setting. Users can write, draw and move objects with a finger, stylus or even a pointer. It connects to a computer through a fast USB 2.0 interface, just plug-n-play, makes the lecture more interactive and enhances the efficiency of the class. It supports Linux, Mac, all Microsoft Windows and multiuser writing and common multi touch gestures currently recognized in Microsoft Win-7/8. Use simple intuitive finger or hand gestures to toss, rotate or zoom in/out. It is based on IR Cell LED Optical technology which uses a combination of IR LEDs and photo transistors aligned in pairs around the active surface. These pairs of LEDs and photo transistors cast a grid over the surface. When the surface is touched, the infrared light beam between the LEDs and the photo transistors is interrupted at the point of touch. This position is converted into an ‘X’ and a ‘Y’ coordinate that the computer then converts into a mouse position.